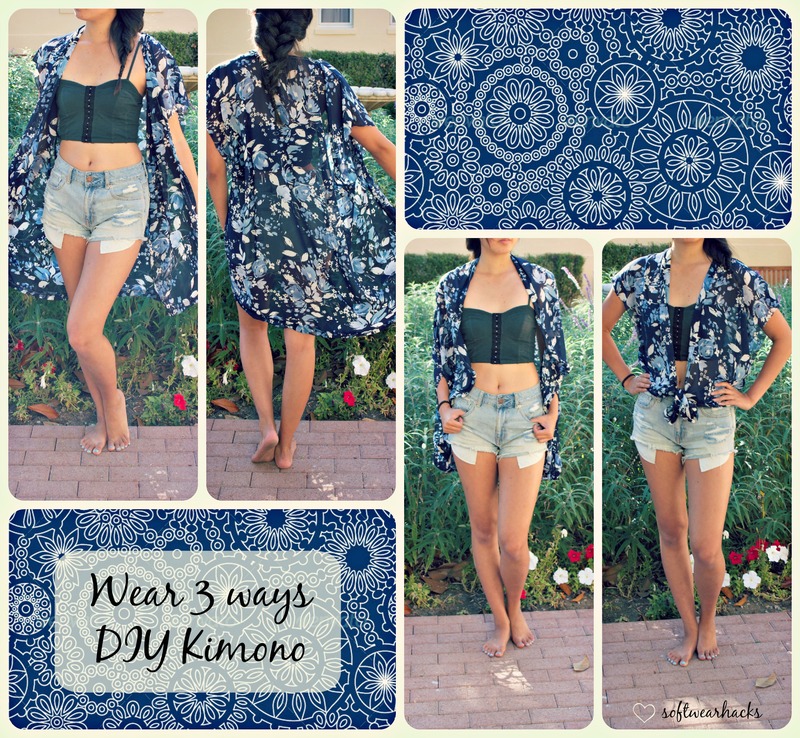 This tutorial teaches you how to make a simple kimono that can be worn in three different ways. Wear it one way, and you have a long, knee length kimono with short sleeves. Wear it a second way, and you have a long-sleeved bat wing cardigan. Tie it in the front, and you have a casual, loose tied top. It’s versatile, and best of all, it’s a quick and easy DIY! It works great both as a cover up for summer crop tops and bathing suits as well as a transition piece with leggings and jeans in the fall. You’ll need a one yard of a loose, flowy fabric. An old scarf works great as well! 1. Find the fabric center. 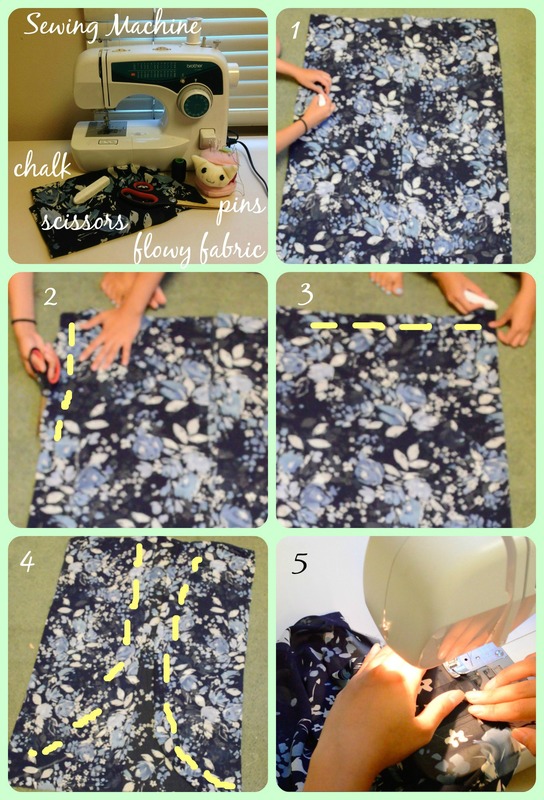 Fold the fabric in half and mark the middle with chalk. Then, fold both sides of the fabric until they meet at the middle mark. 4. Hem the bottom. Mark rounded corners on the front bottom edges. Follow these marks and hem all raw edges of the cardigan, including the lapels and bottom. Roll the edges inward and sew down with a straight stitch. 5. Stitch the sleeve ends. Sew a zigzag stitch around the end of the sleeves to prevent fraying. Trim off loose threads. First look – Simply slip on the kimono. It’s airy, casual, and looks greats with shorts or leggings. Second look – flip the kimono upside down and switch the arm holes. What was originally the right armhole will now be the left, and the left armhole will now be the right. Tug the kimono down so that the bottom of the kimono now drapes around your neck. This creates a shorter cardigan that has long, bat-wing sleeves. Third look – Slip on the original kimono. Pick up the front ends and knot around your waist for a cute tied top.